Lookingglass Theatre’s tradition of using high-spectacle performance to wow the audience has historically been enough to earn them a respected place both in Chicago and around the country. The troupe, rolling off their 2011 Tony Award for Best Regional Theater, celebrates this victory by showcasing their previous work in large format all over their Water Tower space, from the enormous troupe composite shot in the lobby to panoramic publicity photos hung on the walls of the restrooms—yes, Lookingglass barrages the eye, even with their facilities. Despite the theater and ensemble’s overwhelming presence and ability to impress the senses, their new performance of The Great Fire gets in its own way, the design elements depleting the acting talent’s ability to entertain. 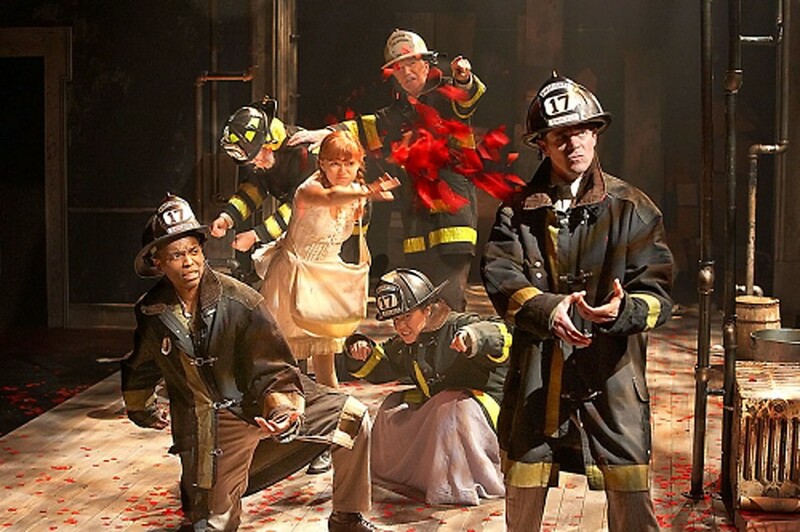 The play retells the story of the Great Chicago Fire of 1871. Written as direct address narratives, John Musial’s script attempts to dig heroes out of the aftermath of the fire, using the original memoirs of several fire survivors. In an interview printed in the program, Musial points out that theater started as stories told around a campfire, as attempts to explain questions, including: “How did our tribe get here? Who are our heroes? What were their great struggles and sacrifices?” Musial hones in on these aspects of the fire, successfully pulling the audience in by using the survival stories of the people who rebuilt Chicago. However, Lookingglass’s interpretation of the text does not so much raise up these stories as drown them in eye candy. The spectacle gets right in the way of many of the better aspects of The Great Fire, but some are undiminished. The surprising opening sequence, which comes before the fireman’s fire speech (replete with puns), is a welcome sight. Everything following this in the plot takes the format of disjointed narrative, and seemingly draws from all aspects of 1871 Chicago, from the obscenely rich and powerful to the penny-scraping immigrants. These characters are powerful elements of the plot, both because they are based on actual citizens of the city during the fire and because of the sometimes impressive performances of the ensemble. Particularly memorable is The Fire, played by Lindsey Noel Whiting, who manages to play a typically inanimate object as both emotionally conflicted and creepy, often at once. Thom Cox, veteran actor of Lookingglass and the Chicago area, manages to play many roles convincingly, from a very young child to the positively hilarious imitation of Roswell Mason, Chicago’s mayor during the fire. Cox gets several of the most memorable lines from the show, including the finale’s anthem, “A new city will rise, phoenix-like, from the ashes, a city second only to itself.” These performances, along with the presence of the rest of the cast, save the performance from burning itself up in the smoke and fire effects it utilizes. The set is impressive, if overdone; Dozens of birdhouses hang from the ceiling, interpolated with vertical pipes running from the ceiling down. The rest of the space echoes the interior of an older house, from slat flooring to a monstrous closet full of junk that covers almost the entirety of the back wall (at least 30 feet high). This design looks inherently functional if one thinks about the tradition of spectacle in this theater. And, sure enough, the set is climbed upon, cut apart, and blown up within the hour and a half that The Great Fire runs. These techniques become something of an annoyance, particularly past the halfway mark, when the company has poured at least five pounds of red confetti (symbolizing fire) onto the stage and continues to sprinkle it. The only spectacle-type actions that redeem the show are the hokey songs spaced throughout the performance. It is surprisingly enjoyable to behold a pair of police officers bopping to a call-and-response song immediately following a tear-jerking scene of loss in the fire.